Become a mentor in the Great Futures Start Here Mentoring Program and inspire a young person to finish middle school and high school, make smarter life choices, go on to higher education and start a fulfilling career. Mentoring is based on the premise that predictable, consistent relationships with stable, competent adults can help youth cope with challenges and steer clear of high-risk behaviors. In a mentoring relationship, mentors provide guidance and support to help young people build self-confidence, learn positive behaviors, stay in school, and avoid potential pitfalls like drugs and gangs. We ask for at least a one year commitment, and one meeting each week for one hour. The Boys & Girls Club wishes to address developing and growing needs in the community by engaging high-risk youth in positive youth development activities, building and strengthening relationships with adults, as well as improving academic success and reducing potential for destructive behaviors amongst participating youth. 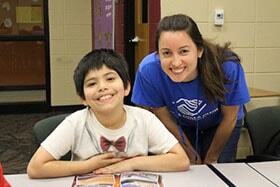 1-2 year commitment: Meet once per week or 4 times a month for one hour with your mentee. 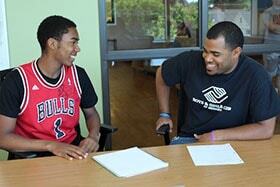 Youth in the program would benefit from having a positive addition to the support system in their lives. Each youth mentee has a specific plan to do better in school and throughout school and life to work on healthy decision making skills and relationship skills to help him or her grow into a productive, responsible and caring citizen. For more information, please contact Madeleine Cohen, Mentoring Coordinator at [email protected] or at (920) 750-5846.